The Cougar Pass route is a new one for our group and our second ride this month with a dirt section. Don't worry, we aren't in danger of becoming and off-road club; but it was fun to explore a new area. On the way to Cougar Pass Road we passed by Fentiman Farms, which is a place where you can buy locally-grown specialty produce. As dirt roads go, Cougar Pass has a pretty good surface for the most part, although probably to be avoided after rain; and it is a relatively normal grade: not nearly as steep as going up Hidden Meadows (my original map had the loop backwards!) There wasn't a single car while we were on the dirt section, which had some great views and nice vegetation. But it sure was a fast descent from the final summit as we had at least a -12% drop and quite a few riders were easily over 40mph. Another good turnout for today's ride; we hit an even dozen and were able to welcome a new rider: Lisa S.
Thanks to Colleen for posting details about the Tour Of California events that Trek is hosting, and you check out the full scoop at their website. So... no doubt about it: bad things can happen fast on a bike. And that was the case for Hubert today, just six miles into the ride and he ended up hitting the pavement hard. Fortunately, his helmet did its job and the paramedics were soon there to get him to a hospital to be fully checked out. I don't know Hubert well, but I suspect he's a pretty strong guy: he was sitting up and trying to get his scrapes cleaned despite our admonitions to wait for the EMTs to arrive. We all wish him a speedy recovery! The rest of the ride proceeded with an abundance of caution, but there were still hills to climb over and roll down, and miles to go before we rested. So we did our best to make it home safely. On the final leg through Escondido we made a stop at Belen Bakery, where we took up all of the available tables and chairs. The group was up to 13 riders today and included a VVV first-timer: Cliff who is a riding buddy of Jerry's. Up to Hidden Meadows on Cougar Pass Road (Dirt). Returning through Jesmond Dene. It was more like February than April this morning, and hard to know whether to keep the layers on or off, but at least the wind was mostly subdued and there was no rain! Actually, it was a good day for a ride and our group of eleven made it up, over, and around the Highland Valley Loop with miles of smiles. The route presents its climbing challenges, but offers some rewarding descents and nice scenery. Only Mike and I made it to the Starbucks in RB, but we had enough calories to make up for the folks who couldn't make the stop today. Out to Fairbanks Ranch, back on the Del Dios, with a coffee stop in Escondido. For those who missed out on last Saturday's Extra Credit Ride, you can check out the action here: Borrego Five-O. Another fun day on bikes in the desert for our group of six riders, which included: Jerry, Les, David, Susan, and Teri. Extra-special kudos to Teri who overcame illness to complete her first ride up the Montezuma Grade! The post-ride lunch at Carmelita's was good, but next time we will probably go to Red Ocotillo. The Red Ocotillo has a quiet, sunny patio dining area, which is really pleasant - as long as the wind cooperates! Beautiful sunshine and a nice route up to Valley Center today, and... drat, I had to miss out! Yes, Sunday's Belgian Waffle Ride took a toll on me, but Mary Ann stepped forward to lead the way, and introduce a few new riders : Hubert, and Sharon and Elwyn, to our cycling contingent. Welcome Aboard and I hope to meet you all soon! a wonderful day for a bike ride, with clear skies, a light breeze, and moderate temps for the crew of 11 riders leaving from VV Park. Matt and Hubert both joined the en-route, so the group reached the Lucky 13 number. The luck must have worked: no mechanicals, no flats, no close calls with vehicles... just a quick up and back. The ride back down was smooth and quick. The wind picked up and buffeted us around a bit on the descent, but it also gave us a little push towards home. 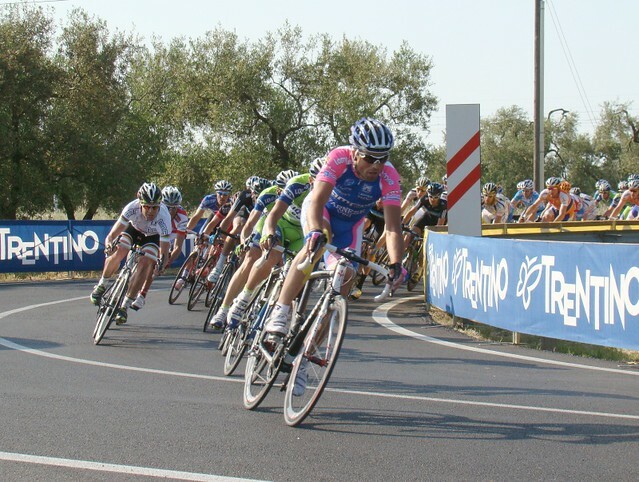 Mike P. gets special mention as the Testa Della Corsa.... he set a pace that made us all chase, going up and coming home. Pictures courtesy of Judy! Scenic riding on Highland Valley Road, with plenty of hills. Check the link above for the ride description, and start and course maps. Carpools: Ramona folks will be forming their own carpools, but anyone is welcome to meet at Valley Verde Park where we will also work out arrangements. Plan to arrive at the park by 6:15am. Our aim is to get sorted out and on the road as soon as possible, but hopefully no later than 6:45am. If you're planning to meet us in Borrego Springs: The estimated drive time from Poway to Borrego Springs is about 1.5 hours. Be there by 8:15am to have time to get ready to ride. This ride should take about 5 hours to complete. Expect to be back to Poway around 5pm. Once again we managed to get fourteen riders out of VV Park and out on the road for a little spin. Today was ACHD Ride day, so naturally something different was required and that turned out to be an extended off-road section along the San Pasqual Valley. It was mostly hard-pack, with a few sand puddles, and just one small hill, but it added a bit of spice to our ride, and we probably surprised a few MTB riders. The Escondido Loop portion was much more conventional and we once again finished it up by taking over Petersons Donut Shop! For everyone who is planning to do the Borrego Five-O extra credit ride on Saturday, April 13th, I have the details on this page. The Ramona folks will be forming their own carpools, and we lowlanders will be leaving from Valley Verde Park. Figure to arrive at the park around 6:15AM - we'll be aiming to get sorted out and on the road as soon as possible but hopefully no later than 6:45. Out-n-Back to Valley Center with a stop at Java Journey.